Too tired to type anything out. 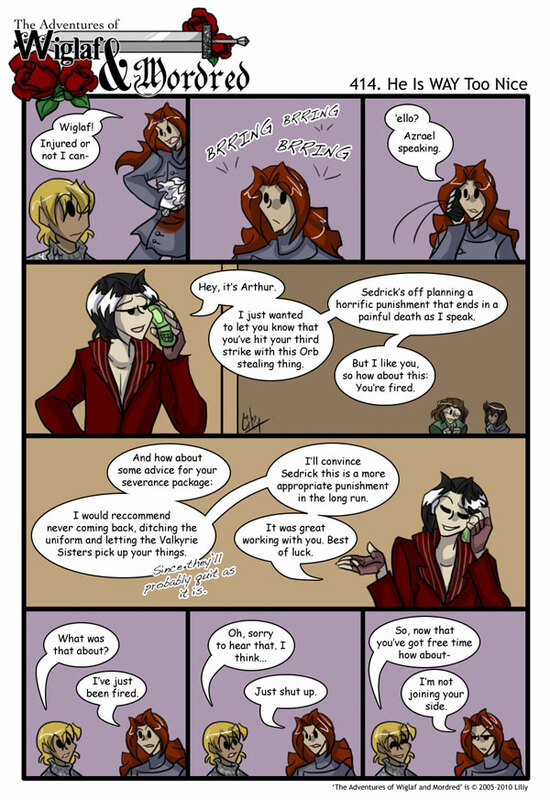 Poor Azrael. At least he’s got a higher chance of survival, now… Arthur really is a nice guy (I think). Also, nice try, Wiglaf… but give the poor man some time! Isn’t this a bit drastic of a way to keep Gawain from revealing that Grace does talk to Azrael? I’ll try to stop second-guessing and wait for how this shakes out. My, this is an interesting turn of events. Heh heh, that was very generous of Arthur. I wonder what Azrael’s gonna do with himself all day now that he can’t command Arthur’s armies. Maybe Janus will take him back. Wait. What does this mean for Azrael’s medical coverage? Is he eligible for COBRA through the Valkyries? Interesting. Mordred’s probably about to hire Azrael. And stick him in the room with Wiglaf. Driver is going to be tickled. Probably stick him Driver’s apartment, then the Vals can come and have a big family reunion. She did warn Mordred about bringing home another pet. But if Wiglaf is inviting him…Wouldn’t that make Azrael Wiglaf’s pet? You know, depending on how long he’s lived with the Valkyries, he could have a polygamous common law marriage! Then he’d be covered by health insurance for sure. That’s true. XD At least, as far as a single common law marriage would go. Depending on the by-laws, though, there might be some sort of special dispensation regarding living in servants’ quarters. He, didn’t see that comin’. *holds up shield* But then you won’t get any more comics! Strike 2 was leaving without permission and bribing Hnaef…Strike 3 was going after the big magic-nullifying object without permission and not telling them…what was strike 1? Or is that way back when he attacked Wiglaf without permission? Shipping Arthur and Azrael now… Someone please stop me! Too much ships going on!